Last week I met up with my wonderful friend, Nina. She rightfully suggested we check out The Organic Grill in the East Village. We met up for dinner on an extremely cold night. But when I walked into the small eatery, which had no more than ten tables, I was immediately greeted by the warm atmosphere, colorful décor and a very friendly host (I wish I had gotten his name). On such a cold night, Nina and I shared a steaming pot of organic loose leaf Elderflower tea. Next, came dinner. I ordered the Raw Kale Salad. This is by far, was the best salad I’ve ever had and I am not exaggerating! This salad was a mix of raw kale, collard greens, dulse, scallions, tomatoes, carrots, hemp seeds and olives, lightly dressed in an AMAZING Sweet Herb dressing! Honestly, this was such a hearty and delicious salad, a meal in itself. Each bite was loaded with crisp, fresh bites of greens and flavor. Now, what’s dinner without dessert? 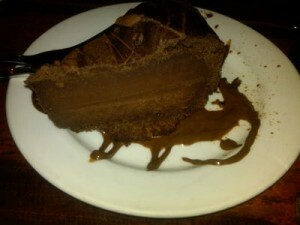 Nina and I shared a slice of delicious Chocolate Mocha Cake. This was a serious chocolate-power cake which I would happily go for seconds! The cake was so fudgy and not too sweet, but very chocolaty! If you guys are in the area, I really do hope you’ll try The Organic Grill out. ** Hi, Nina here. Wanted to say that it’s sooo much fun to eat out with Kanwal, and find out everything about nutrition and food preparation from her. She’s a doll. And I had The Organic Grill Burger which is all vegetarian and was – as the menu suggests – a “party in my mouth”. 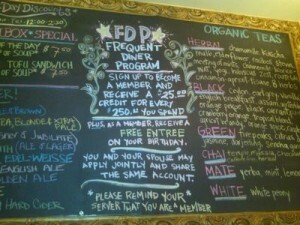 Give this place a try, you’ll become addicted as we now are… Looking forward to the next dinner with Kanwal. Stay tuned for her reviews! This entry was posted on Wednesday, December 15th, 2010 at 4:53 pm and is filed under Food, Tasting the World in NYC.